April 12, 1945: FDR dies in Warm Springs, Georgia. 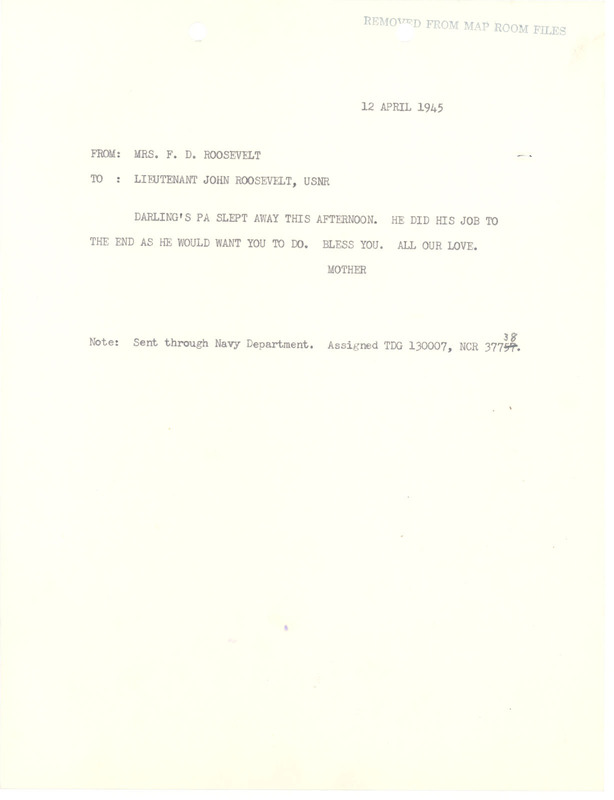 Telegram from Eleanor Roosevelt to son John Roosevelt informing him of Franklin D. Roosevelt's passing. Franklin D. Roosevelt’s funeral service in the East Room of the White House. Franklin D. Roosevelt’s funeral at Hyde Park, New York. On April 12, 1933, Ruth Byran Owen, FDR’s nominee for minister to Denmark was confirmed by the Senate. Owen was the first female American diplomatic officer. On April 14, 1939, FDR asked Hitler and Mussolini for a pledge not to attack or invade nations of Europe and the Middle East. On April 13, 1943, FDR spoke at the dedication of the Thomas Jefferson Memorial. I was 10 when he died. I don’t think any other president will ever compare to his greatness. Were presidents serving more tha eight years in that time? During that time there were no term limits for presidents. Most presidents followed the example of George Washington and served no more than two terms. FDR was quite undecided about running for a third term but did so because of the impending war. The Twenty-second Amendment to the United States Constitution, was ratified in 1951, limited all future presidents to two elected terms.